The latest NX offers a smart blend of style, convenience, and performance. This review was published on June 18, 2013. Since then, this product may have been discontinued or replaced. Pricing and availability may differ from what is stated in the review. The Samsung NX300 (MSRP $749–$999, depending on kit lens choice) is the best camera the Korean manufacturing giant has made to date. A bold claim, perhaps, but also a statement of fact. Compared to most of the major camera makers, Samsung got a late start. 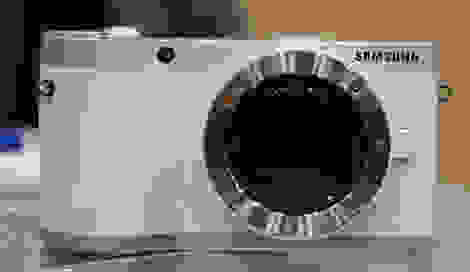 An abortive partnership with Pentax did little to advance its DSLR ambitions, and when the mirrorless revolution got underway, it lagged behind the Micro Four Thirds consortium and its biggest rival, Sony. 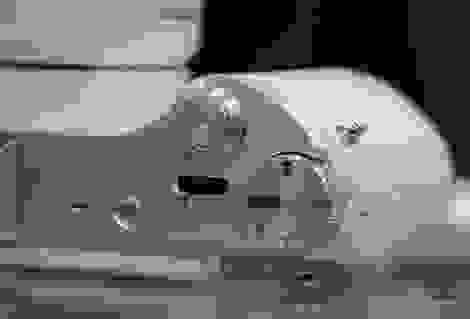 The early NX cameras were slow, buggy, and feature-poor. But as it has in virtually every other industry it's decided to tackle, Samsung has caught up quickly in camera technology. The NX300 is the first of Samsung's cameras that can compete on an even footing with Sony's big guns. Why? Well, that's easy: Samsung paid careful attention and addressed the few complaints users (and reviewers) had with its otherwise promising predecessor, the NX200. The result is a polished, powerful mirrorless camera that should please even the most demanding users. Each of the NX300's three kits includes a free hot shoe–mounted flash. With the unfortunate exception of the cheap-feeling primary control dial, the NX300 is a joy to handle. 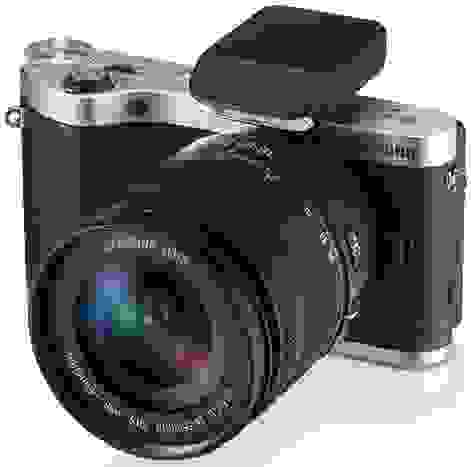 Offered in black, white, or brown leatherette, each with brushed metal accents, there's no doubt that the NX300 is a stylish camera aimed at a discerning buyer. The build quality is similarly high-end; despite the largely plastic external construction we didn't observe any creaks or groans from the chassis. All of the buttons and dials have a comforting tactility, too. All, that is, except for the main control dial, which is one of our few ergonomic disappointments. Its loose, cheap feel is distinctly at odds with the NX300's otherwise precision-machined aesthetics. With that unfortunate exception, the NX300 is a joy to handle. The faux-leather covering and sizable front grip give you plenty to hold onto. We were also big fans of the shutter release, which has a nice soft press down to a hard half-stop, and then a satisfying click for the full stroke (accompanied by the solid thwack of the shutter itself). With the exception of the WiFi, video recording, and EV compensation buttons—three that you definitely don't want to hit by accident—all of the buttons are raised so that you can manipulate them without glancing away from the screen. We were impressed with both the simplicity and depth of Samsung's NX300 menu system. The addition of a tilting touchscreen (45 degrees down and 90 degrees up, on a reassuringly solid hinge) is a great improvement over the earlier NX200. The NX300's 3.31-inch AMOLED panel is absolutely top notch, and its capacitive touch interface is among the best we've used on any camera. You can't drag the focus point around the screen like you can on some Micro Four Thirds cameras, and you can't pinch to zoom in playback, but touch-to-focus is snappy and it's easy to swipe left and right through shots you've taken. Touch and directional pad control are completely interchangeable for menu navigation. Menu design is a tricky business, but Samsung has managed to hit a happy medium. Menu design is always a tricky business. Play it too safe (like the Sony NEX cameras) and you end up with an interface that looks like it was created for toddlers; give people everything they say they want (like the Olympus PENs) and you get accused of making your menus inscrutable. With the latest revision of the NX menu system, Samsung has hit a happy medium. The layout itself is dead simple: four tabs, each containing a scrolling list of settings. But beneath that simplicity you'll find a whole lot of depth; the Samsung menus never settle for just the usual options when they can provide you with more. 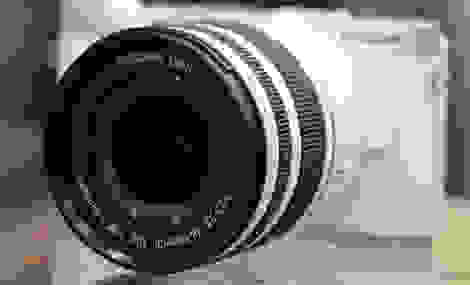 Another key hardware improvement is the introduction of phase detection pixels on the image sensor, which should help with autofocus speed and tracking. We've seen similar tech from Sony and Canon over the past year, and it works just as well here for Samsung. The NX300 is quick to focus and tracks moving targets exceptionally well for a mirrorless camera. Focus confirmation can be hard to come by in very dim conditions and you'll get some false locks, but they're typically quite obvious. 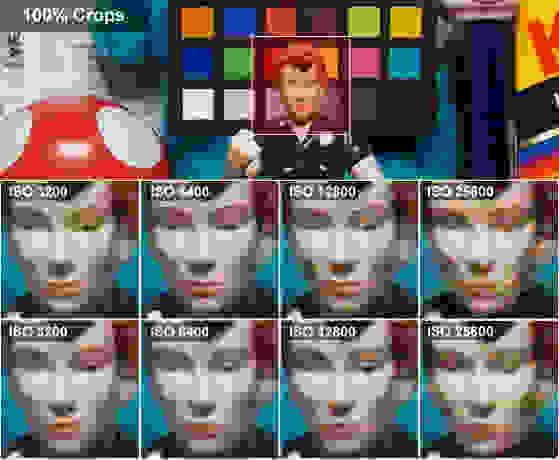 The NX300's in-camera image editing tools are surprisingly comprehensive. When it comes time to review your shots, the NX300 provides some of the best image-editing tools we've ever seen. 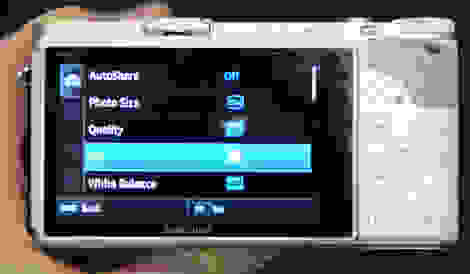 You have sliders for brightness, contrast, saturation, RGB adjustments, color temperature, exposure, and hue. The touchscreen interface makes it supremely easy to fine-tune the resulting output, though you might find yourself wishing for an even larger, higher-res screen. The cropping tool is also surprisingly flexible, giving you two "handles" to grab and drag the crop area anywhere you please. We're not sure why you'd want to do so much editing in-camera, but if the idea speaks to you, Samsung provides the best experience around. 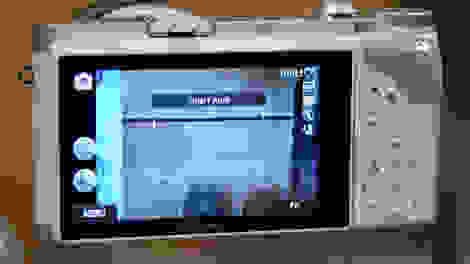 On the video side, the NX300 sports exceptionally smooth 1080/60p recording, albeit in the H.264 MP4 format rather than the increasingly common AVCHD. You also have 1080/30p, two flavors of 720p, two standard-def settings, and even the oddball (though very welcome) option of shooting 1080x810 video at 24 fps—essentially 2.35:1 "Cinemascope" format. There's also fast- (5x, 10x, 20x) and slow-motion (0.5x, 0.25x) recording via the Multi Motion setting. These look great, though the slow-mo options are limited to standard-def resolutions. Direct connection to a smartphone or tablet works quickly and painlessly, either via WiFi or NFC. And then there's 3D shooting. Yep, the NX300 is capable of recording 3D stills and video—one of its three kit options even includes the 45mm f/1.8 2D/3D lens. We had that unique piece of glass in for testing, and we can confirm that the extra-dimensional output looks great. Is it worth spending extra money on the tech when major networks are giving up on 3D content? Maybe not, but it's still a cool party trick, and right in line with the NX300's philosophy of "more is more." We heaped praise upon the NX200's 20.3-megapixel CMOS sensor, so it's mostly good news that the silicon remains unchanged in the NX300. To begin with, we recorded extremely impressive dynamic range figures in the lab—and they were backed up by real-world shooting. Sharpness was similarly impressive with the 18-55mm OIS kit lens, though aided to a certain degree by JPEG processing that oversharpened our shots by as much as 15%. Image noise was kept in check through ISO 3200, regardless of what noise reduction setting we applied. In fact, noise levels didn't break the 1% threshold until ISO 6400 in any NR mode, though with NR completely turned off they went straight from 0.97% at ISO 3200 to 2.20% at ISO 6400 before hitting a whopping 4.89% at the maximum sensitivity of ISO 25600. Here you can see the effect of the Normal noise reduction setting (bottom) at the highest ISO settings, compared to the output with NR Off (top). This tells us two things. 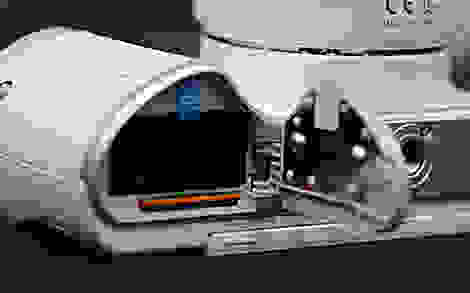 One, the sensor's native sensitivity range is ISO 100-3200, and 6400-25600 are what's known as "expanded" ISO Settings. (Need more proof? The Auto-ISO mode won't let you set a limit higher than 3200.) Two, you shouldn't use the highest settings unless you absolutely have to. The results just don't bear scrutiny. Color accuracy was solid using the most accurate color profile (Standard); for most day-to-day shooting situations it will be just fine, but we wouldn't go so far as to recommend shooting JPEG studio portraits with this camera. You could tweak the color profiles for more accurate results, but shooting RAW is probably a better idea. White balance was similarly decent, if not particularly impressive. In incandescent light, the NX300 actually produces more accurate whites than many cameras in its price range, but it gives up a little accuracy under compact white fluorescents and daylight. Custom white balance wasn't clinically perfect (if you need that, look to Panasonic's M43 bodies), but certainly good enough for just about anyone. 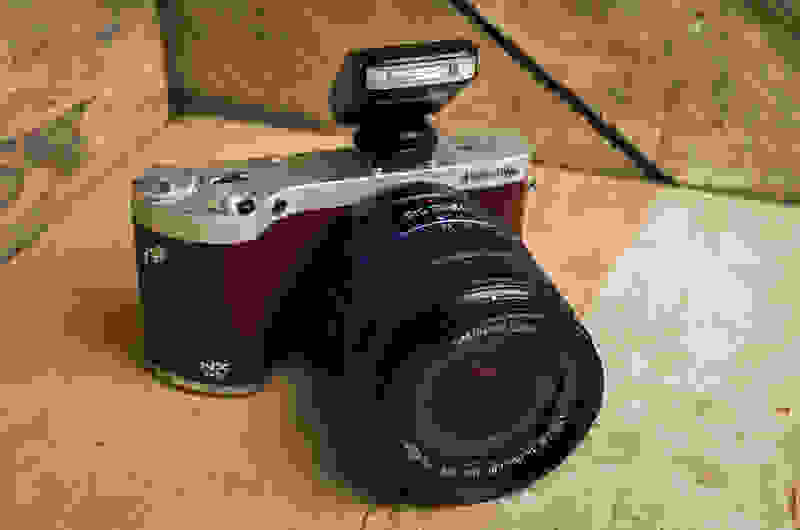 For an in-depth discussion of the NX300's performance, visit the Science page. With its 1080/60p recording mode, the NX300 produced extremely smooth video. We were only able to detect the tiniest bit of trailing on moving objects like the pinwheel and train stripes in our still life test. 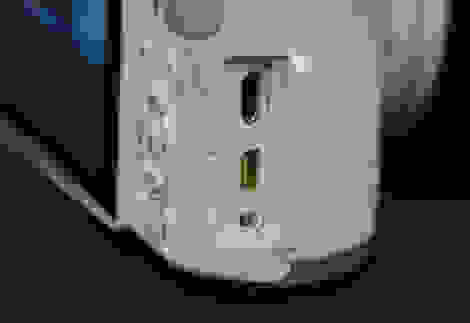 We did detect a little aliasing on the edges of diagonal lines, as in the Kodak logo. Sharpness was very good with the 18-55mm kit lens. The NX300 resolved 775 lp/ph of vertical resolution and 700 lp/ph on the horizontal under bright studio lights. When we lowered the lights to 60 lux, the apparent sharpness plummeted to 675 lp/ph on the horizontal and 600 lp/ph on the vertical, largely due to increased image noise and artifacting. 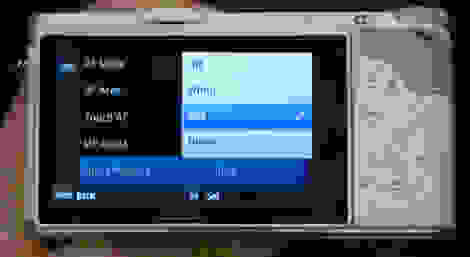 That brings us to the NX300's biggest failing: Its video isn't very good in dim light. Despite the sensor's excellent performance outdoors and in bright studio lighting, when conditions get difficult it all falls to pieces. 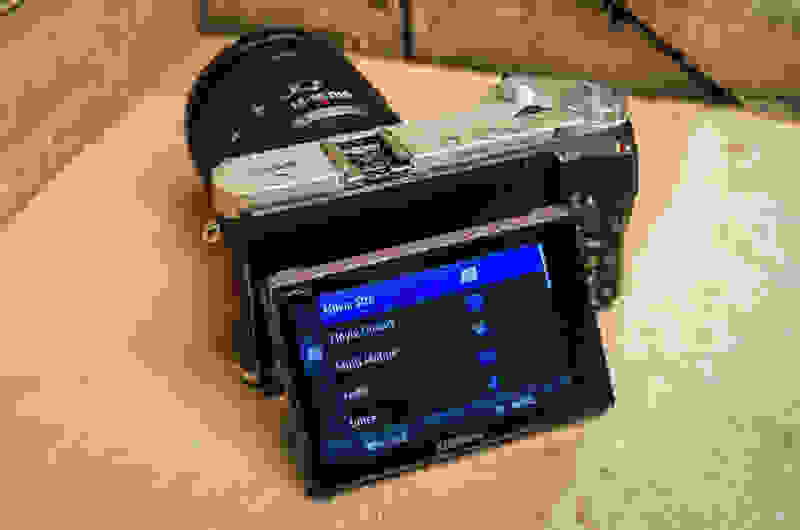 In our standard low-light video sensitivity test, the NX300 required 21 lux of ambient illumination to record an image that registered 50 IRE on a waveform monitor (a standard test for broadcast-ready brightness). There are some small-sensor compacts that can do the same with just 5 lux, so this is a very disappointing result. The NX300 is a great camera. So what? Plenty of manufacturers are making great cameras that are dying on the vine. This one doesn't say Canon or Nikon on it—why should you care? Why should you throw in with an upstart brand—especially one without a photography pedigree? The 45mm f/1.8 2D/3D and 85mm f/1.4 are just two of the NX mount's stable of 12 lenses. There are a few good reasons. For one, Samsung has been aggressively developing its photography portfolio over the last couple years, and in doing so it's been willing to take risks and innovate. Many of those innovations are irrelevant to the enthusiast photographers who would be interested in the NX300—smartphones with zoom lenses, for instance—but the salient point is that the company isn't standing still in a changing marketplace. Second, Samsung is rapidly improving on its existing products. 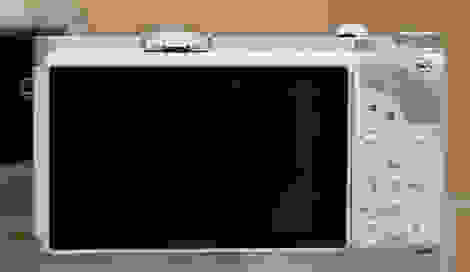 Despite sharing much of its predecessor's basic DNA, the NX300 is a far better camera than the NX200. The tilting touchscreen, faster processor, and phase-detection autofocus make a real difference and show that the company is paying attention to what its customers want and need. And then there's Samsung's considerable war chest. 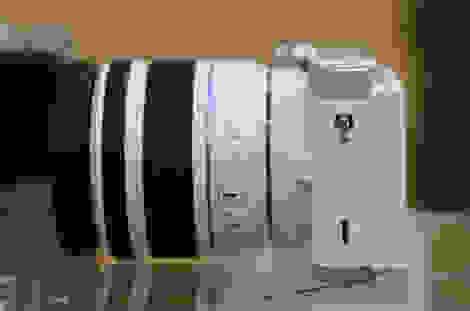 All of the other mirrorless camera manufacturers are struggling with some sort of financial woe—Sony, Panasonic, and Olympus have each had well-publicized issues with losses, disappointing sales figures, and/or alleged fraud. Samsung, on the other hand, remains immensely profitable, and that means there's plenty of money to fund R&D. Is the NX300 a solid springboard for a leap of faith? In our opinion, yes. Granted, the camera business doesn't seem to be high on Samsung's list of priorities. Given the NX system's incredibly small niche in the company's almost unfathomably large product portfolio, it's not inconceivable that Samsung could ditch the whole experiment and redirect resources to its booming smartphone and television businesses. Is the NX300 a solid springboard for a leap of faith? In our opinion, yes. With strong image quality from a proven 20.3-megapixel sensor, comfortable handling, and a fantastic user interface, it's every bit as capable a tool as the competition from Sony and Micro Four Thirds. Taken with the 45mm f/1.8 2D/3D lens. f/5.6, 1/400sec, ISO 100, -1EV. Taken with the 45mm f/1.8 2D/3D lens. f/5.6, 1/1000sec, ISO 100, -1EV. Taken with the 45mm f/1.8 2D/3D lens. f/4, 1/100sec, ISO 200. Taken with the 45mm f/1.8 2D/3D lens. f/2.8, 1/160sec, ISO 200. Taken with the 45mm f/1.8 2D/3D lens. f/4, 1/8sec, ISO 1600. Taken with the 45mm f/1.8 2D/3D lens. f/2.8, 1/80sec, ISO 400. Taken with the 45mm f/1.8 2D/3D lens. f/1.8, 1/80sec, ISO 800. Taken with the 45mm f/1.8 2D/3D lens. f/2.8, 1/50sec, ISO 3200. Taken with the 45mm f/1.8 2D/3D lens. f/1.8, 1/80sec, ISO 3200. Taken with the 45mm f/1.8 2D/3D lens. f/1.8, 1/80sec, ISO 400. Taken with the 45mm f/1.8 2D/3D lens. f/1.8, 1/160sec, ISO 200. Taken with the 45mm f/1.8 2D/3D lens. f/2.8, 1/80sec, ISO 800. Taken with the 45mm f/1.8 2D/3D lens. f/1.8, 1/80sec, ISO 200. Taken with the 45mm f/1.8 2D/3D lens. f/5.6, 1/80sec, ISO 400. Taken with the 45mm f/1.8 2D/3D lens. f/5.6, 1/80sec, ISO 1600.